A Great Gift and a Wonderful way to Remember!! 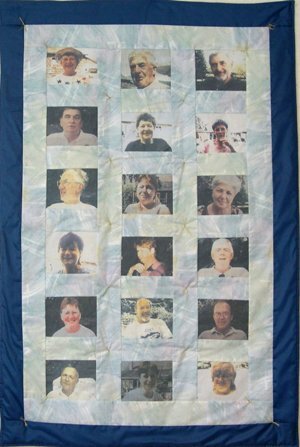 Memory Quilts are a wonderful way to commemmorate a special occasion like a wedding, or a special anniversary or birthday. They are totally unique and the recipients are awed by the memories. 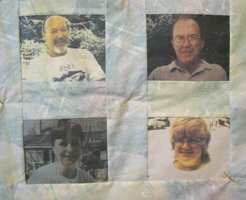 These special memorial quilts are often made up of photos printed on fabric, as well as pieces of sentimental fabric and even small trinkets or toys. They can also be made from pieces of fabric given to friends and family to create a work of art. What a wonderful way to show Mom how much we love her. The photo memory quilts below shows the memory quilt my family made for my Mother's 70th birthday. 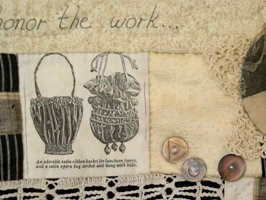 Each person got a 12 1/2" square, and free rein to create in thread, fabric, paint, whatever. This is my Mom's Memory Quilt. It has blocks made by each of her kids, as well as the grandchildren. Some of the blocks are painted and some are embroidered. I sewed it together, alternating the embellished blocks with plain blocks. 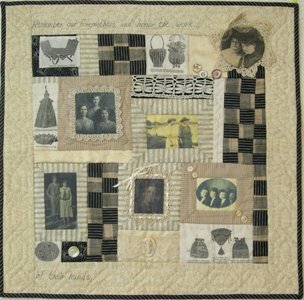 This memory quilt was made as a sample for a quilt store in Minnesota owned by my friend Judy Schollen. The quilter used old photos, antique fabrics, as well as bits of old lace and buttons. 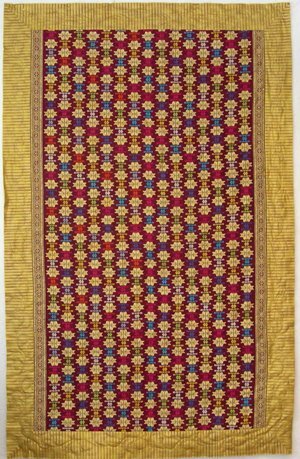 A close-up of some of the details on this antique looking memorial quilt. This quilt is was made by my friend and sister quilter Judy Schollen. It has pictures of Judy (lower right hand picture) and her husband Len (the picture above). The other photos are all of Len's brothers and sisters and their spouses. 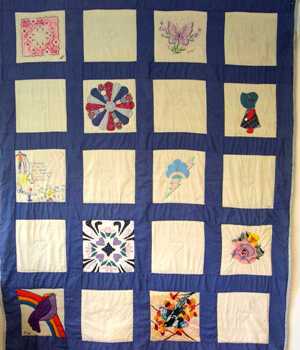 Judy made this tied quilt in 1997. 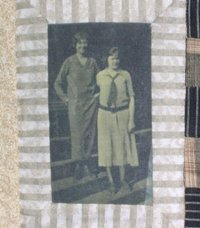 With advances in computer and photo technology that are available today, photos are easier then ever to incorporate into your quilt. All you need is a digital camera or scanner (printers usually come with scanners these days) a good printer and fabric sheets. To research the types of inkjet fabric paper available click here and key in "inkjet fabric" in the search box then make a selection based on the review of fellow quilters. Start by transferring your pictures into your computer by downloading them from your digital camera or scan them in from your printer. The next step is the important one. One that you will need to "play" with. It is getting the colours the way you want them. Most computers with Microsoft software come with Picture Manager so you can play with the hues, sharpness and size. It enables you to crop your photos, as well as adjust the color and contrast. Do a sample print onto paper to make sure you are happy with the end result. Your Memory Quilt is "priceless" so make sure you use high quality printing. Now that your photographs are ready, print onto ready made inkjet printer fabric sheets. You can find them at some quilt shops, online, or make your own. If you are concerned about the quality of your printer, you can take your photographs to a store that prints on teeshirts, they usually have all the equipment to print high quality pictures on fabric. Finished with "Memory Quilts" Return "Home"